Angels Oracle Card Readings : USD $ 45. Payble by PAYPAL. ASK 3 QUESTIONS ABOUT PERSON. 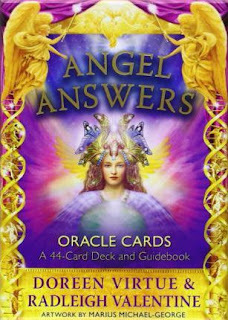 Get a Angel card reading from your angel messenger which will give guidance to you in most important aspect of life. These angel card reading are the best oracle card reading online from elevated angels, spirit guides or guardian angels in the oracle card deck authored by Doreen Virtue. One gets connected with these in the Claircognizance psychic readings. In this module you can ask three questions and after you have made the payment your questions will be answered email. Get personalized insight on any issues or aspects of life like marriage, career, job, health or relationhips, travel abroad, divorce, court cases, business, spiritual growth, and get answers to your questions now. You can make the payments with Bank transfer, Paypal, Check, Cash etc. All information you provide us is kept strictly private and is not shard with anyone.